This Gothic Revival church of granite in historic Union was founded in 1855 at the behest of resident Mary Dawkins and her sisters, Charlotte Poulton and Jane McLure. Mary Dawkins’ husband, Judge Thomas Dawkins, was the rare South Carolina Unionist during the days of the nullification controversy. Though Judge Dawkins was in the minority, he was nonetheless admired by his peers enough to be elected to South Carolina’s state legislature. After the Civil War, Judge Dawkins served in the South Carolina State Convention in September of 1865. His home, the Judge Thomas Dawkins House, remains a fixture in Union. 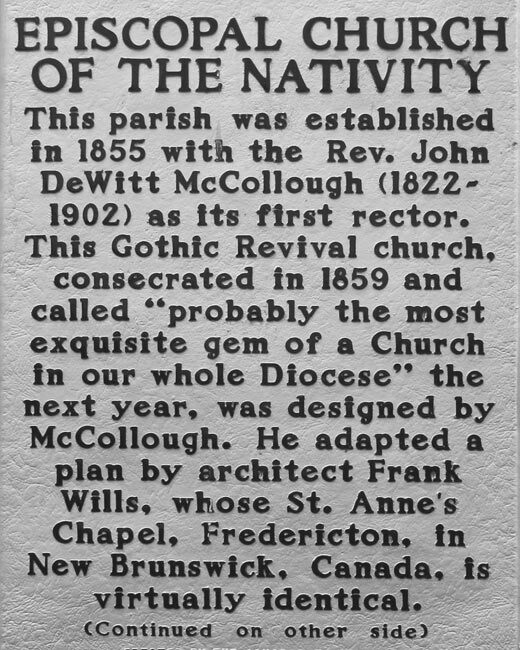 The first rector to serve the Episcopal Church of the Nativity was the Reverend John DeWitt McCollough. He also designed the church, using plans similar to St. Anne’s Chapel in New Brunswick, Canada. The two churches are nearly identical, though St. Anne’s is made of sandstone. 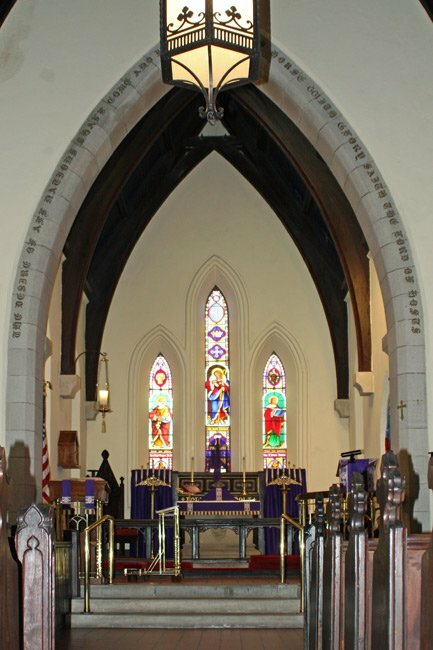 The Reverend McCollough also built many of the original altar pieces, some of which have since been replaced, as well as the pews, which are still in use today. The stained glass chancel triplet window was designed by Louis Tiffany. 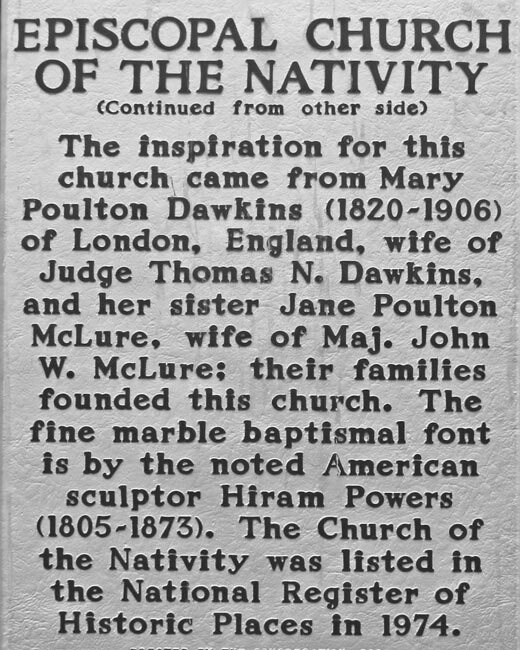 Also of note is the church’s marble baptismal font, a work of sculptor Hiram Powers. 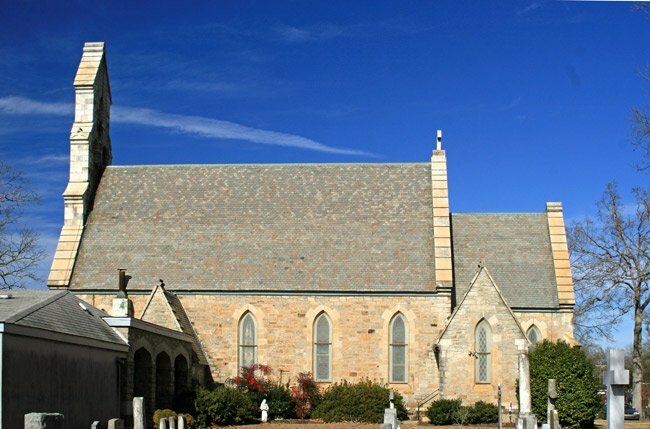 The Church of the Nativity is the first Episcopal church in South Carolina made of stone. It was consecrated in 1859. The Church of the Nativity in Union is a notable example of Gothic Revival ecclesiastical architecture. 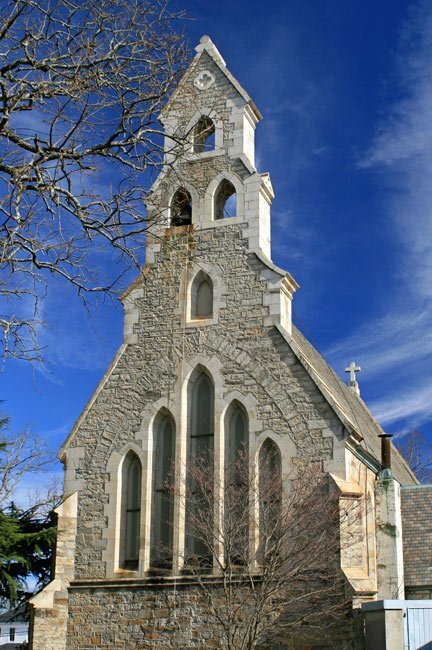 Delicately articulated exterior details, high quality craftsmanship in stone, and the Louis Tiffany stained glass chancel triplet window combine to make the Church of the Nativity one of the finest Episcopal parish churches in the Southeast. 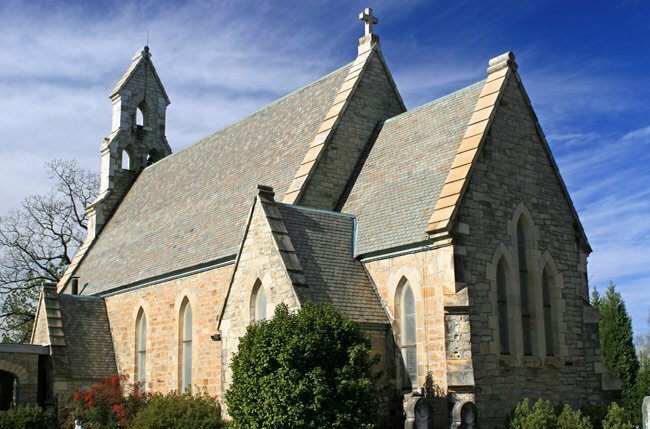 The church belongs to a stylistic group of unpretentious parish churches of the 1840s and 1850s that feature small size, diagonal buttresses, a feeling for stone, and an intimate relationship between the building and surrounding landscape. These characteristics derive from English parish-church architecture of the fourteenth century. Two of the major forces behind the construction of the church, Charlotte Poulton, and her sister, Mary Poulton Dawkins, were Englishwomen newly arrived from outside of London. They, along with Reverend John D. McCollough, who had already designed a number of Episcopal churches in South Carolina were knowledgeable about the leading currents in ecclesiastical architecture. On May 1, 1855, the cornerstone was laid but construction did not begin until the following year. Construction was interrupted by the Civil War, but the church was completed shortly thereafter. Hiram Powers, noted American sculptor, carved the octagonal white Carrara marble font that stands in the nave of the church.